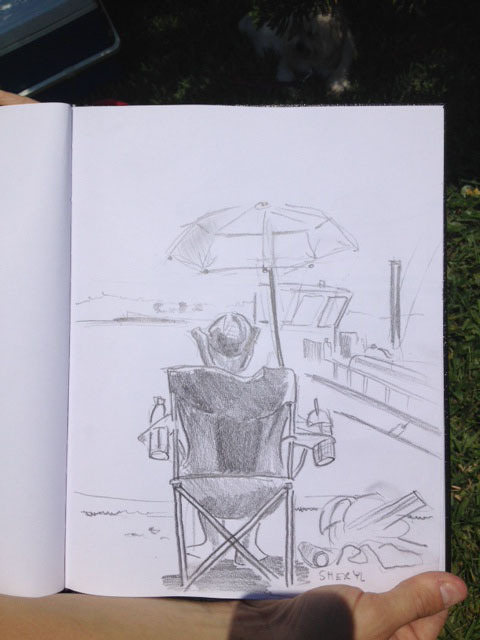 It was MY weekend to paint with Jodi Ohl and plein air with the OOPS group. 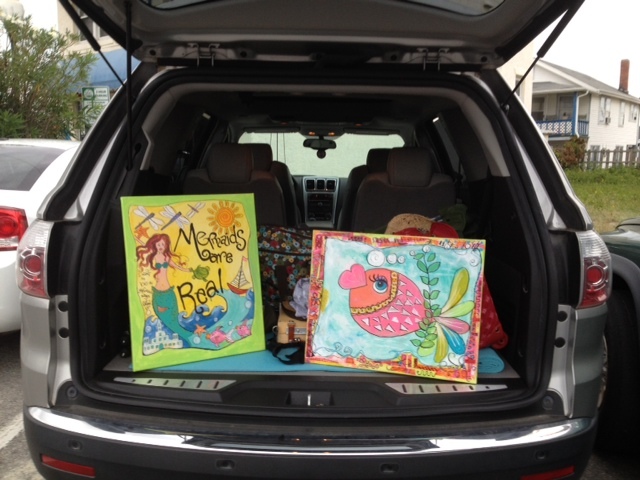 Funky fish and a mermaid theme were my choices for a fun play with paint at Artful Living in Carolina Beach. 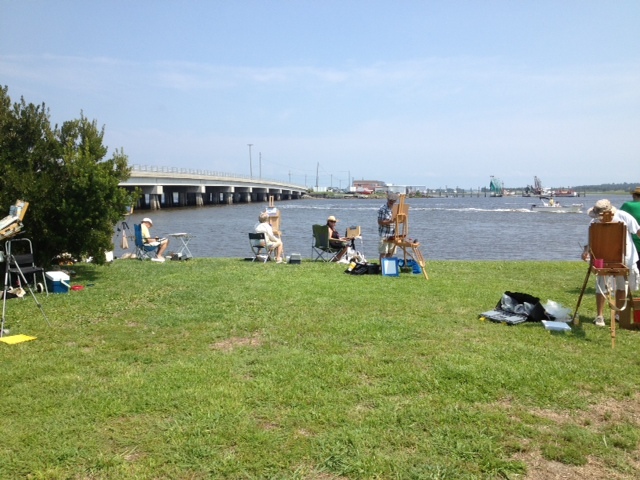 Sunday I joined the OOPS group (Onslow Outdoor Painting Society) for an afternoon of painting in historic Swansboro. I was thrilled to paint among new friends and some that I’ve known for only a year or so. One of my highlights of the weekend was meeting a young artist/mom from Camp Lejeune, she reminded me so much of Angie, one of my favorite students from years ago. 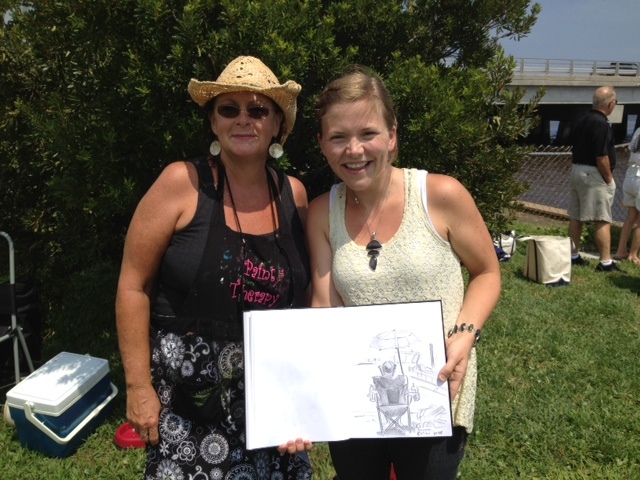 Gwyn is so talented, she drew several of us as we painted under the blazing sun……..here’s a photo of the two of us and her drawing of me. Here’s a happy childhood moment between two close cousins who are now in their twenties. Hawley is newly married and wanted to do something special for her maid of honor, Caroline, so she asked me to paint this moment from an old photograph. The two cousins have share many special moments throughout their lives. Congratulations Mrs. Hawley Maynard Hunt on your wedding and Caroline, I hope you enjoy your special gift. I transformed my oasis island titled “Anything Goes” into a floating studio, complete with brushes, paints and watercolor paper. As the artist in me looked around with discerning eyes around the lake, I noted the new little chapel at Clearwater. It’s sweet and charming little steeple rises sharply above the surrounding buildings. 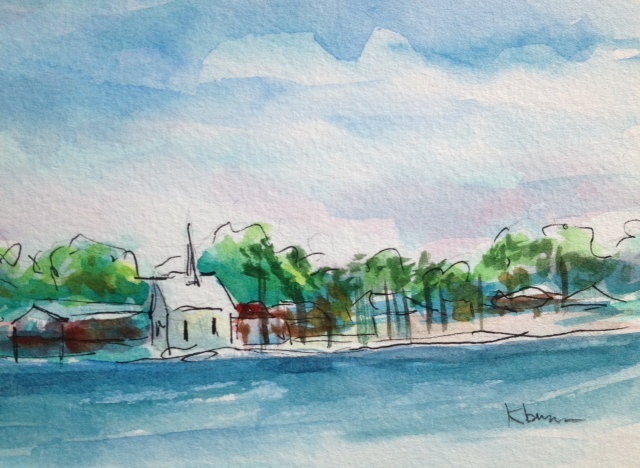 This little watercolor is painted with water from White Lake, all I needed to do when I rinsed my brush or loaded it with water and paint was to just swish my brush lazily in the water. 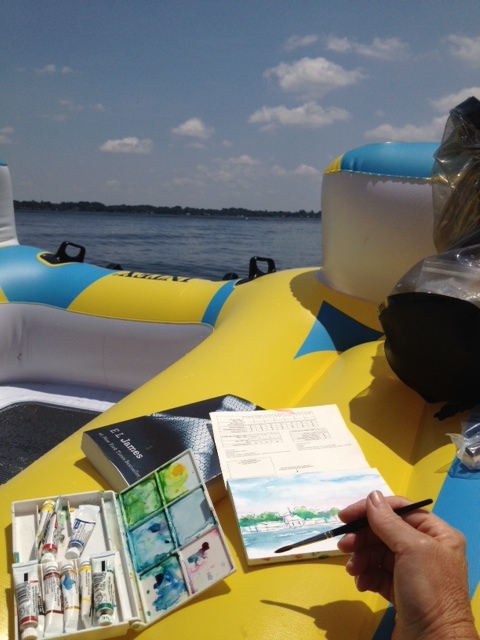 Beware White Lakers…..caution if you see me aboard my floating studio, I maybe painting you! 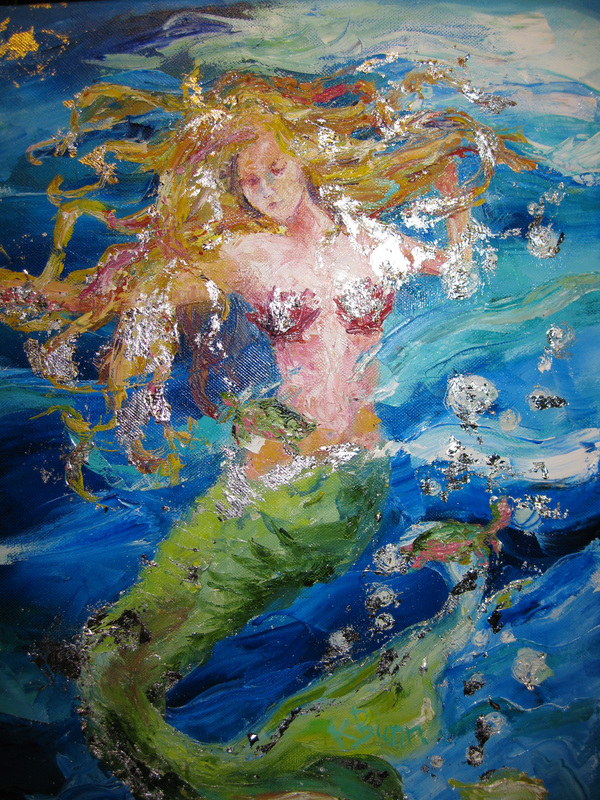 Painting mermaids became a personal joy a few years ago, in fact, I want to be a mermaid when I grow up! One of my customer/friends loves mermaids as much as I do and has found a smart savy way to decorate. 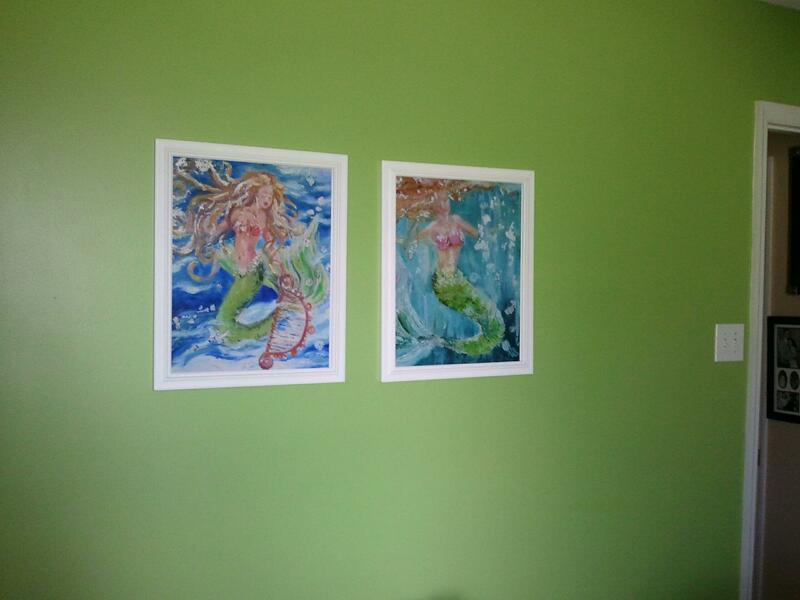 She bought mermaid prints from me and framed them herself, then painted her walls to complement the mermaid prints. 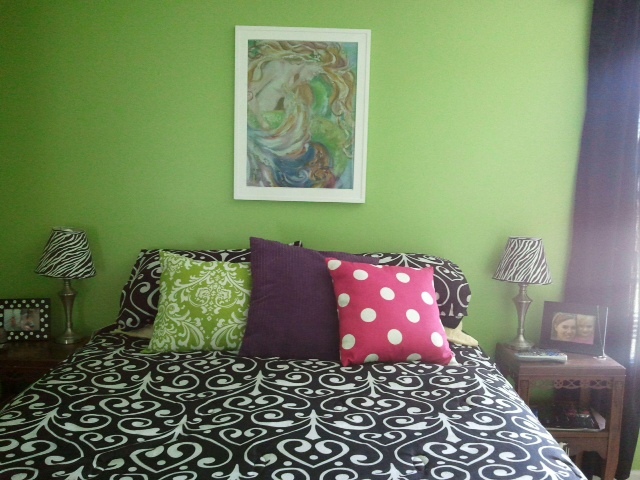 The white frames make the mermaids pop against her pretty green wall. Stunning I might add, not to mention my ego has incredibly been blown sky high! I love Cristy’s decor, don’t you? I love brown boxes from Jerry’s! We have special people in our lives and when their birthday comes around we want to give them something unique and special. Laura asked me to paint a special portrait as a gift for Mark’s birthday. 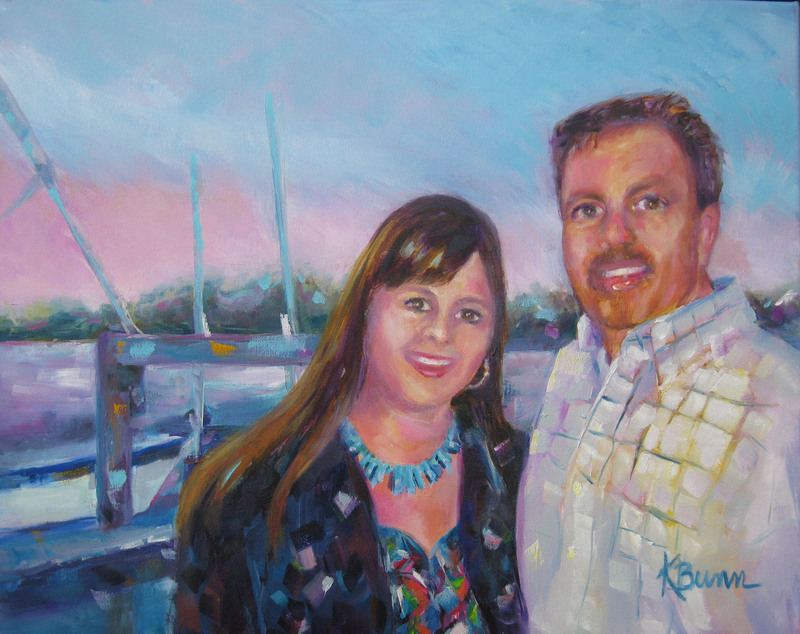 What an honor to be given the opportunity to paint their portrait for such a special occasion. I thought it might be interesting to show you the photograph I worked from and the finished portrait. 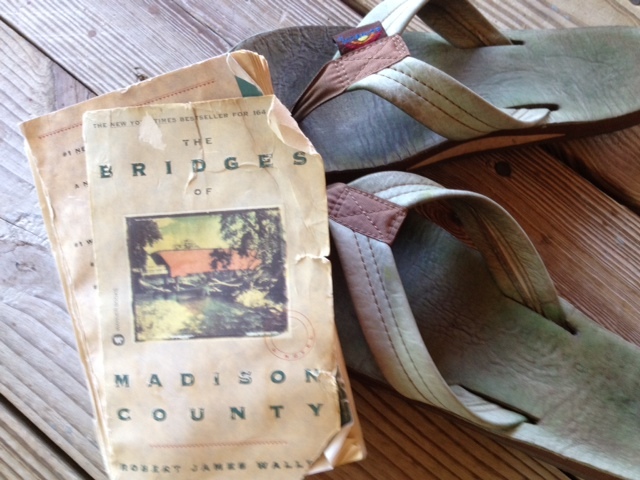 Here’s a good book It’s a long hot summer folks here in the south and one of my favorite things to do (when I’m not painting) is to read down by the lake, so I wanted to share one of my great summer books , “The Bridges of Madison County” by Robert James Waller. The story is about Robert Kincaid, a photographer searching for covered bridges and a housewife Francesca Johnson who is searching for girlhood dreams. One true love, covered bridges and dreams you will encounter in this short read. I really truly recommend this book, I’m taking it down to the water today to reread as I always do each summer….. the book is worn and coming apart, but still has magic………..kind of like life at times? 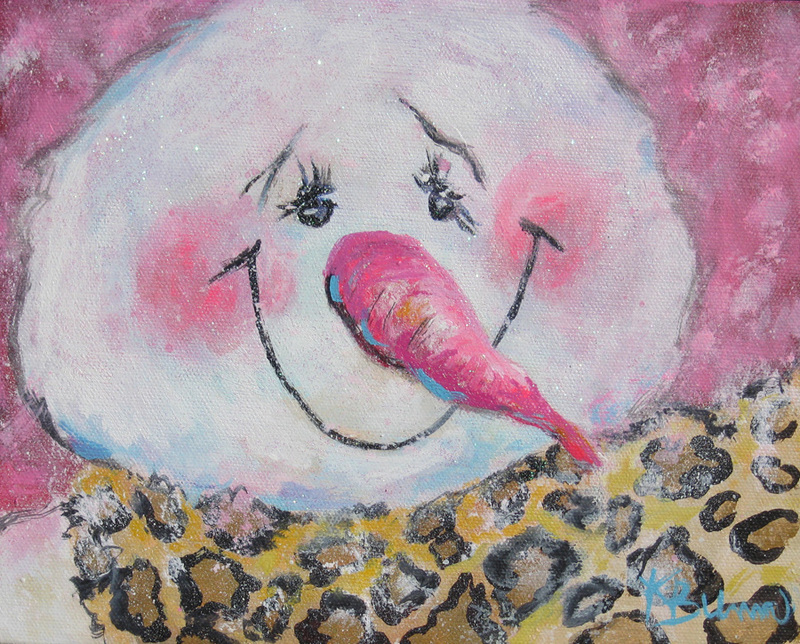 Every Christmas I create a new series of paintings that I sell at Smellie Bloomers, a local gift shop in Elizabethtown, NC. 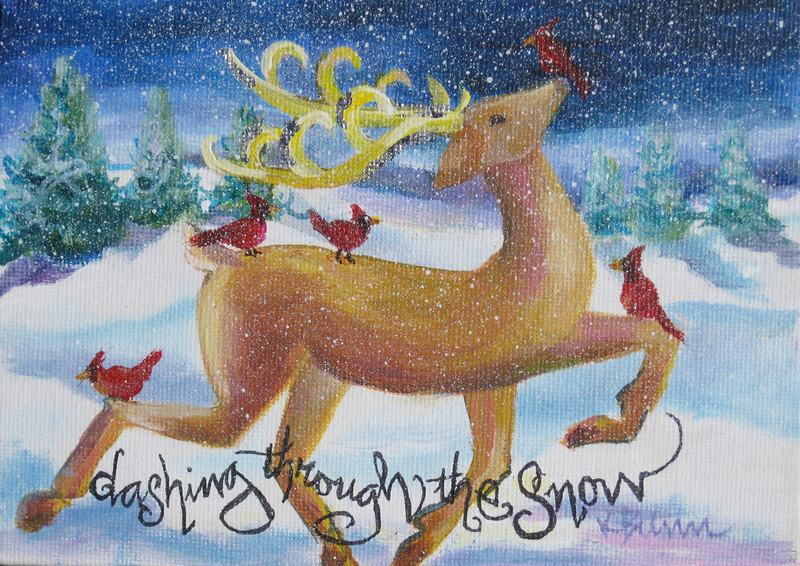 The first year I painted Santas, the second year I painted snowmen and last year I had a reindeer theme. 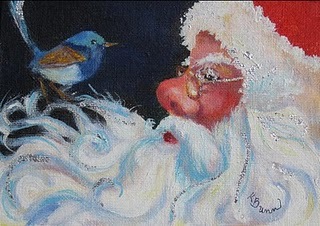 Each year I listen to my friends and family and get ideas from them as to what Christmas subject they would like to see me paint. I am happy to announce this will be the year of angels, afterall couldn’t we all use a few more angels in our lives? 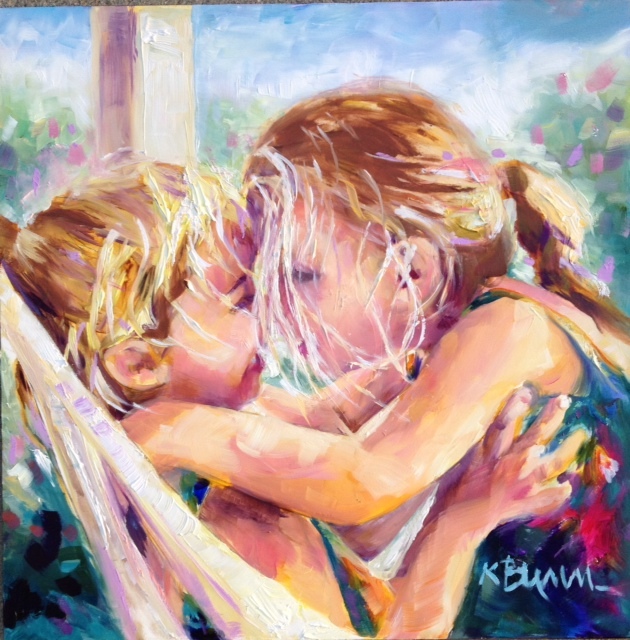 Okay, let me get back to my easel and continue on one angel that I’ve already started……….ooooh, I think there might be an angel give-away coming up in the future, what do you think? I love to use bright colors in my paintings and last week I decided to give myself a pedicure. Voila! 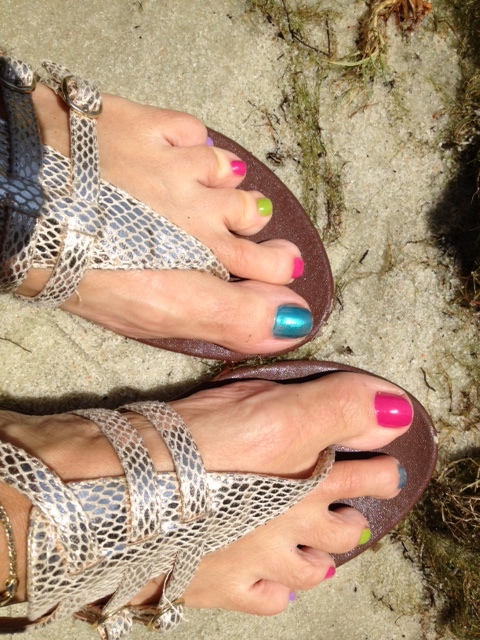 The bright colors found their way from my palette to my toes. 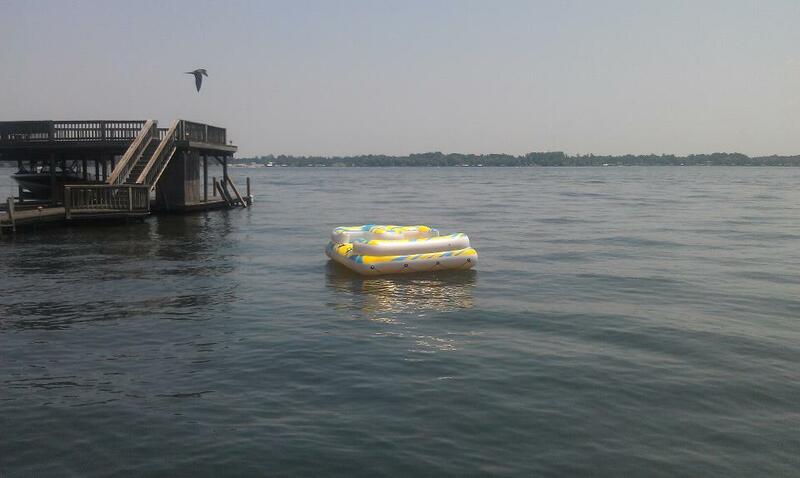 Happy lazy days of summer to all of you, thanks for stopping by! 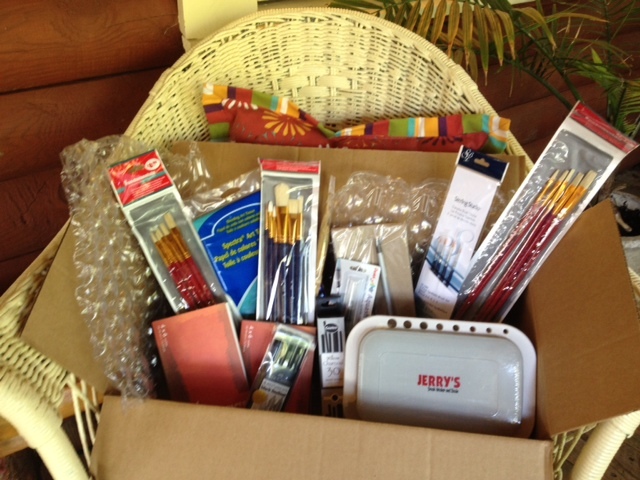 Welcome to “Tuesday’s Treasure Chest” full of tidbits and good ole stuff for the creative soul! Here’s a line from one of my fave movies, Forrest Gump……….My momma always said, “Life was like a box of chocolates. You never know what you’re gonna get.” So heads up my friends, you’ll never know what you’re going to see or read here either. People ask what kind of paint I use so I thought I would take a moment to share. Most of my oil paintings are created with Winsor & Newton, which is a moderately priced oil paint. A few others I use are Richeson Oil, Sennelier Oil, Rembrandt and Charvin. Charvin oil paint has been around for over 175 years and was used by the famous Cezanne. I have found that my work looks much better if I don’t use the cheap paint, if I’m going to spend time painting something special, I want good materials. 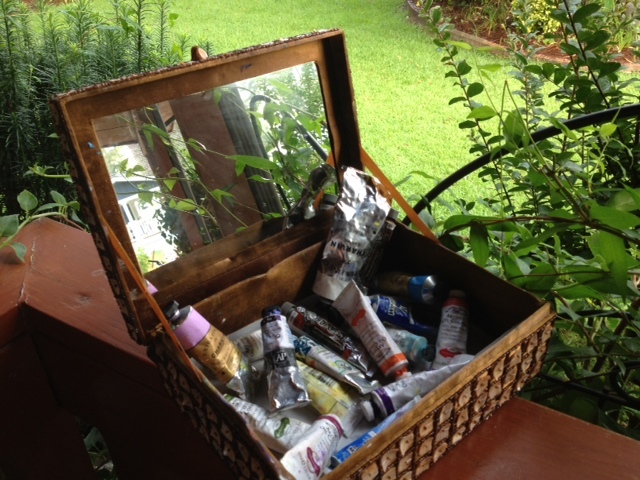 I keep my paints in a box, kind of like a treasure chest. Hand Sanitizer Gets Paint Out! Most of the time I wear an apron, but still manage to get paint on my clothes, imagine that? I stumbled upon this quick paint spot remover/ cleaner quite by accident about a year ago, not only does it help fight germs, it is EXCELLENT for getting paint out of clothes or out of carpet. It does not matter if you use the one with aloe, or the plain one, the expensive one or the cheap stinky stuff from the Dollar Store. 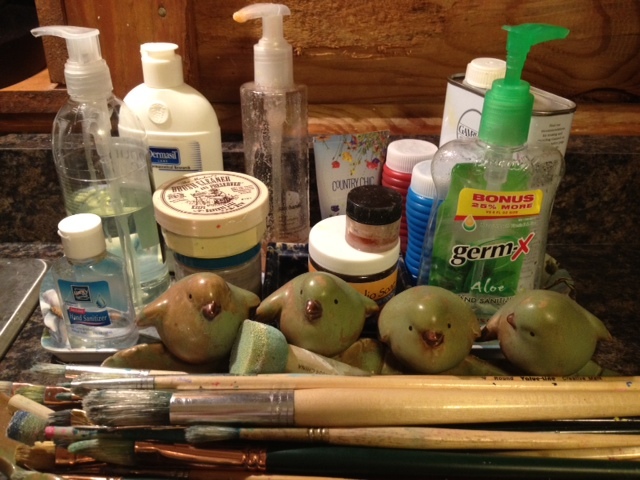 Hand sanitizer holds a royal place by my brushes and sink. Congratulations to Vivian Sholar, her name was drawn from www.random.org and has she has chosen the mermaid print “Buttercup” for her prize. 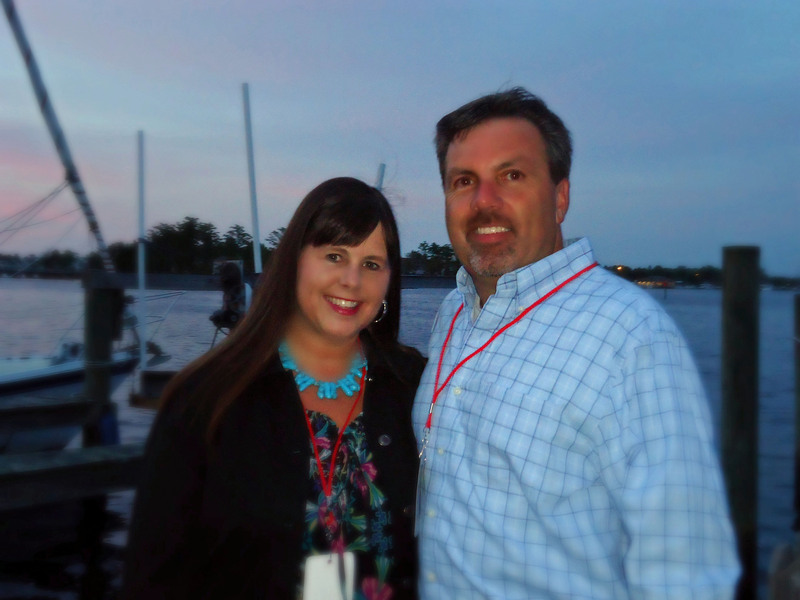 Thanks Vivian for following my blog and to everyone who took the time to follow! Each month I will be doing another give-away, if you follow my blog you automatically will be entered each month for a Kathy SurPRIZE! You will receive a surprise from me if you follow my blog by midnight tonight! Each week I will share my newest paintings, techniques and/or tips. Winner will be announced tomorrow where I”ll be featuring “Tuesday’s Treasure Chest” where I’ll be sharing more cool stuff.